Insider: Breva Genève Génie 03 Speedmeter. A Timepiece with an Anemometer and a Micro-Rotor. Breva Genève is now very well known for creating timepieces that include some sort of mechanical function that revolves around the earth's elements. 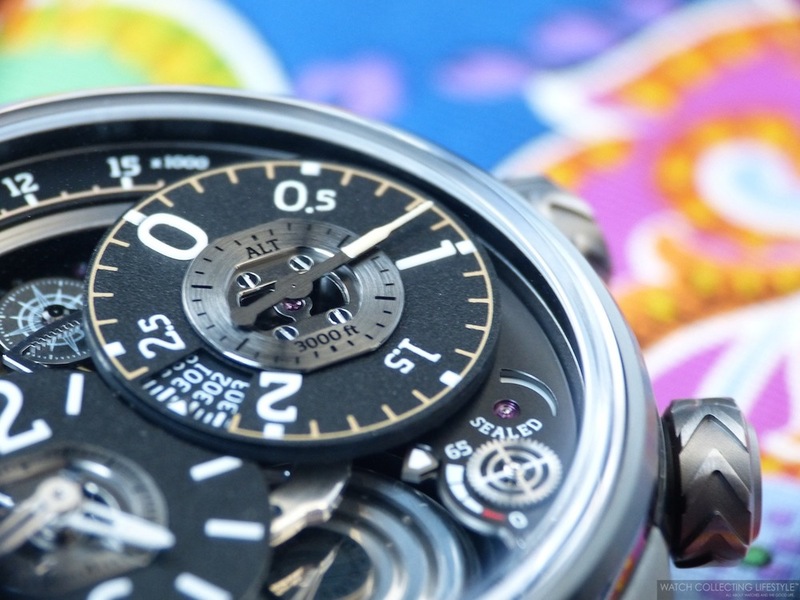 While their first watch included an actual mechanical barometer with a weather forecasting station on the wrist, their second timepiece included a mechanical altimeter. This time, Breva Genève presents a watch that includes an anemometer that pops up right on top of the watch dial. Named the Génie 03 Speedmeter —Speedometer as it is also referred to on their website—, this new mechanical timepiece is far from conventional, but not necessarily the most functional or even applicable to every day life events. While prior to the appearance of this timepiece, watches could only calculate speed by using a tachymetric scale, Breva Gèneve tries to make a statement with a timepiece that claims to provide an accurate speed reading in what they refer to as 'real-time'. Now, not sure how real time works when driving or flying in an enclosed vehicle or when the measurement is influenced by wind speed around you but we'll talk about that as we continue with our hands-on review. Posted on February 19, 2015 by Editor & Publisher and filed under Breva, Other Brands and tagged Breva Génie 03 Speedmeter Breva Génie 03 Speedometer Breva Calibre BRE03.001 Top Brands Most Popular. 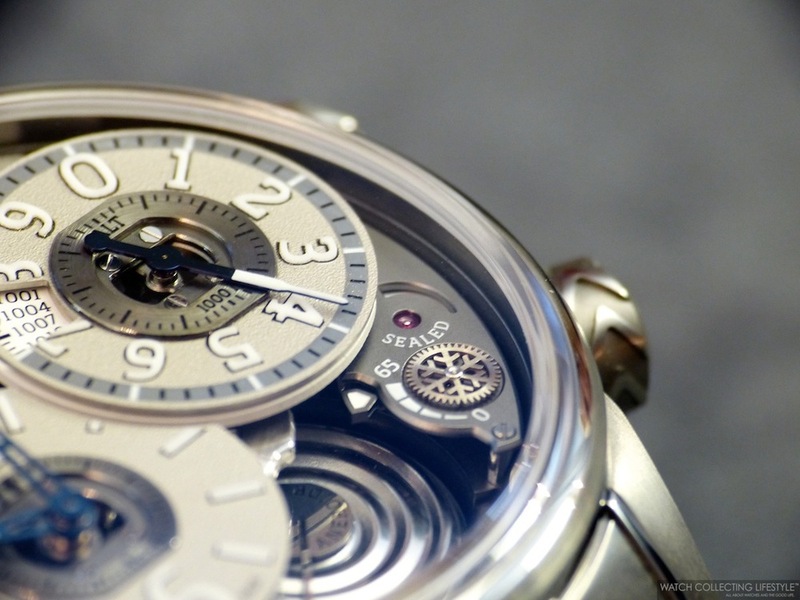 Baselworld 2014: Presenting the Breva Genève Génie 02 Air. Now in a Black Titanium Case with Flight Levels. 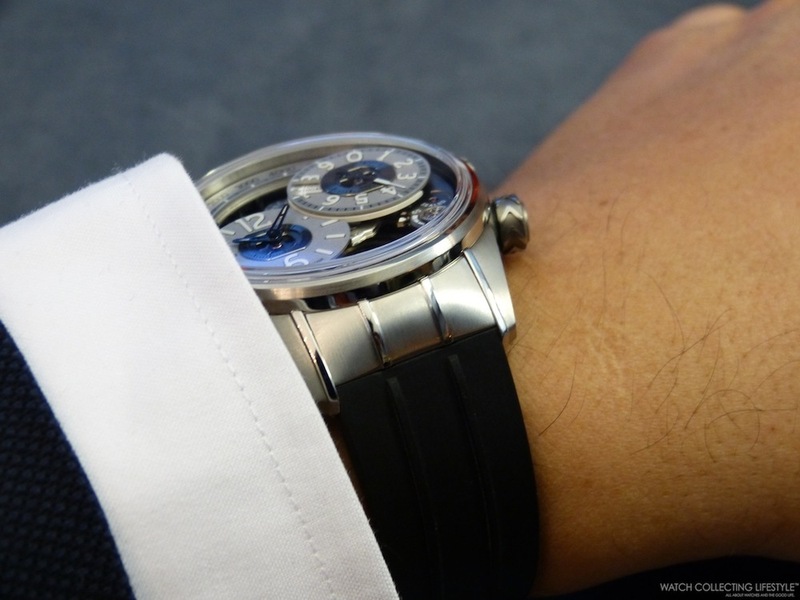 Back in February, we brought you the news on the new Breva Génie 02 Terre with a full review with live pictures here. This time, we are presenting you the new addition to the Génie 02 family, the new Baselworld 2014 Breva Génie 02 Air which combines the stunning sophistication of a beautifully crafted mechanical timepiece with the practicality of a fully functional, high-performance altimeter with flight levels. Whether your passion is paragliding, flying, skydiving, hang gliding, mountain climbing, skiing, or simply enjoying the fresh air and stunning views that high altitudes offer, the Génie 02 Air is the perfect companion. The black titanium case of the Génie 02 Air offers a subtle but stunning backdrop to the high-legibility hands and markers, ensuring that essential information, i.e. time and altitude, is easily visible at a glance. The dial side of the timepiece is dominated by a sub-dial at 8 o'clock displaying hours and minutes, and the precision altimeter sub-dial at 2 o'clock displaying meters or feet. Arching around the top of the dial is the large-scale altitude indicator, which displays up to 5,000 meters or 16,400 feet, with small seconds below. At 4 o'clock, an indicator is revealed when the air valve is open or closed —it must be open to indicate the altitude. Below that indicator, there is a 65-hour power reserve indicator. In pride of place at the bottom of the dial is one of two aneroid capsules measuring air pressure —from which the altitude is derived—, with a high-precision arm multiplying by 200 the expansion and contraction of the capsules and relaying the air pressure to the two altitude indications. 1. 9 o'clock: a two-position crown both winds the movement and sets the time. 2. 2 o'clock: a screw down crown rotates both the altitude's precision-scale and large-scale to adjust for variations in air pressure, which affects altitude readings. 3. 4 o'clock: a screw down crown either seals air out of the movement or allows it in —for altitude function. Longevity and reliability of the timepiece are maximized by means of an osmotic Teflon membrane that filters any moisture and humidity from air before it enters the movement. Just above the crown, a red band on the dial marked “SEALED” warns when the valve is unlocked. A pilot must recalibrate the altimeter according to local air pressure at sea level, in order to take into account natural variations of pressure over time due to weather and temperature. If altimeters are not calibrated before flight, two aircraft could be flying at the same altitude even though their altimeters indicate that they are at different altitudes. To ensure aeronautic safety, planes and air traffic controllers use flight levels, which is a nominal pressure altitude in feet divided by 100 and always divisible by 500 —so always ending in 0 or 5—, rather than actual height above sea level. For example, 33,000 feet is referred to as "flight level 330”. Actual altitudes above ground are not as important for flight safety as the difference in altitudes between planes. This difference can be determined from the air pressure at each craft, and does not require knowledge of the local air pressure on the ground. Flight levels solve this problem by defining altitudes based on a standardized air pressure at sea level. All aircraft operating on flight levels calibrate to this setting regardless of the actual sea level pressure. A second advantage of flying at a consistent flight level, rather than true altitude, is that an aircraft's aerodynamic and engine performance depend on air pressure rather than its true altitude above ground or sea level. It is much easier to trim a plane to operate efficiently at a specific air pressure rather than altitude. The superbly finished proprietary movement, much of which can be fully appreciated through the open dial and display back, was developed exclusively for Breva by award-winning movement constructor Jean-François Mojon from Chronode. The movement includes 415 components and is framed by the code names of many of the world's airports, engraved around the perimeter of the case back along with their altitudes above sea level. The final airport codes are yet to be confirmed. The Génie 02 Air is available in a limited edition of 55 pieces in black titanium G5 with rubber strap and is available with calibrations in either meters or feet. Sticker Price $132,000 USD. For more info on Breva click here. Case material: black titanium G5 measuring 44.70 mm x 16.10 mm. Dial: grained and galvanized nickel silver indexes and numbers in three-dimensional superluminova. Movement: Proprietary movement developed exclusively for Breva by Jean-François Mojon/Chronode with 415 components, 45 jewels and a power reserve of 65 hours. 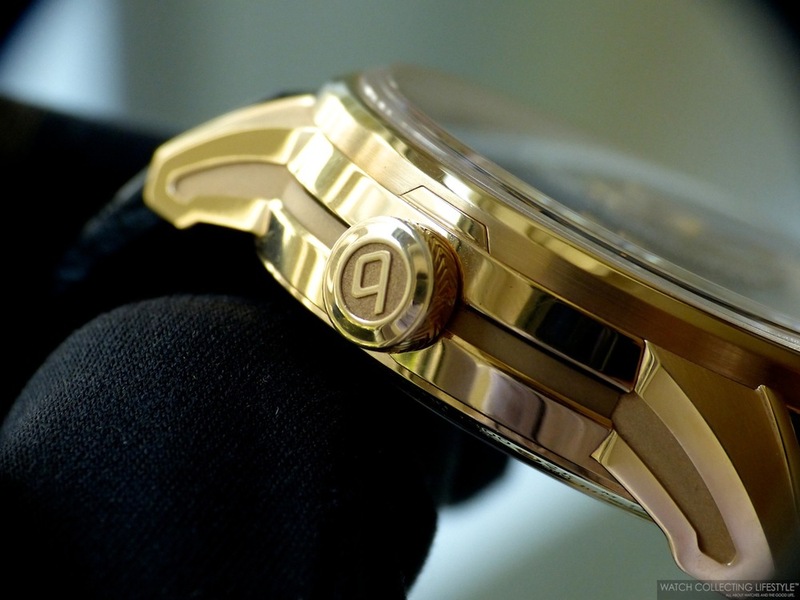 Posted on March 29, 2014 by Editor & Publisher and filed under Baselworld, Breva and tagged Breva Génie 02 Air Breva Genève Génie 02 Air. 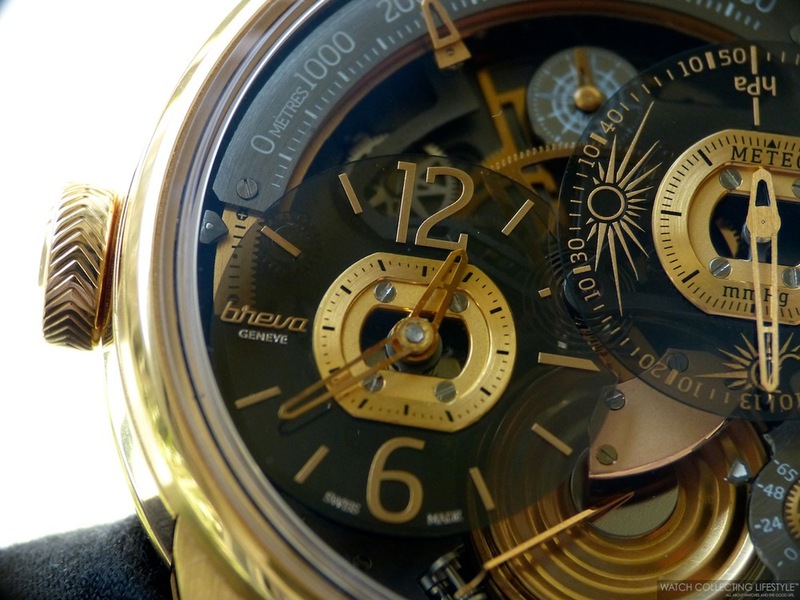 Breva Genève is a company that was founded by Vincent Dupontreué on his 33rd birthday in 2010. Fueled by his desire for a nice complicated watch and inspired by a beautiful weekend in Italy's Lake Como, the Breva name came to mind —as ‘La Breva’ is a warm southern wind contributing to the agreeably mild micro-climate around Lake Como— and the marvelous idea of creating a mechanical timepiece that would also forecast the weather. In 2013, after three years of research and development, led by Jean-François Mojon, Vincent Dupontreué launched the Breva Génie 01. The Breva Génie 01 is available in a limited edition of 55 pieces —of each metal— with a beautiful and very solid case measuring 44.7mm in diameter in either white gold or rose gold. The watch is fitted with three dual-purpose crowns on the caseband. The winding crown is located at 9 o'clock —engraved with Breva's logo—, a second crown located at 2 o'clock is used to make adjustments to the barometric pressure disc and to adjust the position of the altimeter when resetting it via a pusher —this crown is engraved with a wind rose— and a third crown at 4 o’clock is used to lock and unlock the air valve that gauges the atmospheric pressure —engraved with the word AIR. When this third crown is unlocked, the valve opens and allows a small amount of air to equalize air pressure inside the case with the exterior air pressure. Longevity and reliability of the timepiece are maximized by means of an osmotic Teflon membrane that filters any moisture from any air before it enters the movement. The multi-layer skeletonized dial features several easy-to-read indicators to keep the wearer fully informed about the time, altitude, power reserve and the weather forecast. The watch features two sub-dials in smoked sapphire crystal with the hours/minutes dial at 8 and the barometer at 2 o'clock with icons providing scientifically based forecasts of likely weather conditions to come. The altitude indicator is located on the top part of the dial as a small flange. Additionally, there is a small indicator at 12 for the running seconds and a 65-hour power reserve indicator at 4 o'clock that is beautifully decorated with a wind rose. Right above the power reserve indicator there is an indicator marked ‘SEALED' that warns when the air valve is in the unlocked position. By now, most of you might be wondering how this mechanical masterpiece works. Well, at 6 o’clock, there are two aneroid capsules stacked one above the other to measure the slightest change in air pressure as air goes into the watch via the AIR crown. As air goes in, the aneroid capsule expands or contracts with changing air pressure to provide an accurate forecast of the weather conditions. The aneroid capsules in the Breva Génie 01 were especially developed to Breva's specifications to optimise their precision and use in a wristwatch. The capsules are made from a special non-magnetic memory-metal —Breva patented invention— lighter and stronger than aluminum and twice as ductile as steel. A clearly visible lever rests on top of the aneroid capsules and transmits the combined height of the capsules through a complex system of gears and racks to the altimeter indication and the barometer. The altitude display reads from -300 to +5,300 meters, while the barometric display ranges between 973 and 1053 hectopascals —hPa. In a nod to the original method of measuring air pressure in inches of Mercury, an inner scale of the barometer is marked mmHg: Hg being the atomic name for Mercury —Hg from the Greek hydrargyrum meaning ‘silver water’. However, it is important to mention that the watch does not contain any Mercury in it. This fascinating horological complication is powered by a proprietary manual-wound movement developed exclusively for Breva by Jean-François Mojon from Chronode. The calibre is composed of 405 parts, 46 jewels and beats at a frequency of 28,800 vph. When fully wound, the calibre provides a power reserve of 65 hours. This gorgeous calibre can be fully appreciated via the display case back. The case back features an engraved hectopascal and altimeter scale. This watch is fitted with an elegant black hand-stitched alligator strap with folding clasp. The strap is very comfortable and extremely supple. Even though the watch is waterproof rated to a depth of 30 meters, we wouldn't dare to get this gorgeous strap nor the watch wet. On the wrist the Breva Génie 01 wears true to its dimensions and perhaps a little bit too high on the wrist. This fascinating complication is one that will for sure become a conversation starter with other watchlifestylers. We have included an image of the white gold version at the bottom of this review for those of you that like the understated look of the precious metal in its white finish variation. Sticker Price $150,000 USD. Only $5,000 USD more for the white gold version. For more info on Breva Genève click here. Posted on October 22, 2013 by Editor & Publisher and filed under Other Brands, Breva and tagged Breva Geneve Genie 01 Breva Watch With Barometer and Altimeter Breva Genie 01 Barometer Watch Posts 2013.